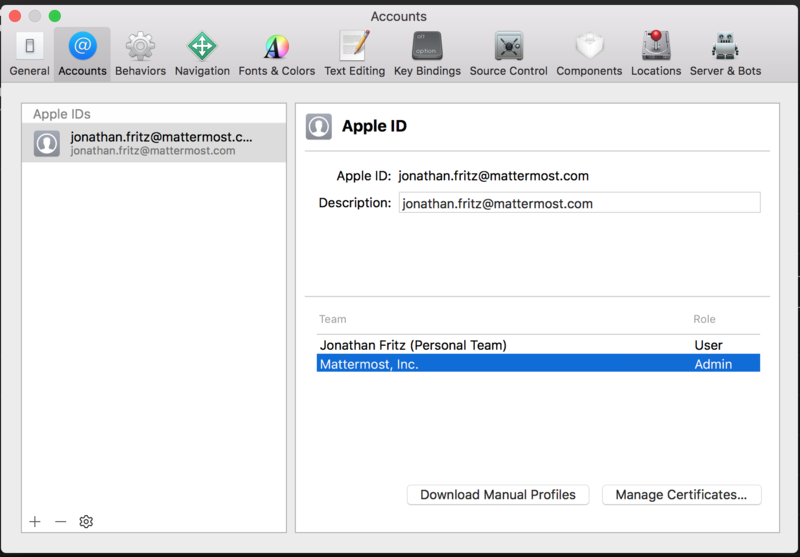 When releasing the Mattermost Desktop application for Windows and macOS, we have to sign the executable with a certificate that allows the end user’s computer to verify our identity. The signing procedure varies depending on the platform that the release is destined for and the platform that the signing operation is performed on. This page attempts to document the procedure and some common pitfalls that developers may encounter along the way. Releases destined for Windows can be code signed on Windows, macOS, or Linux. 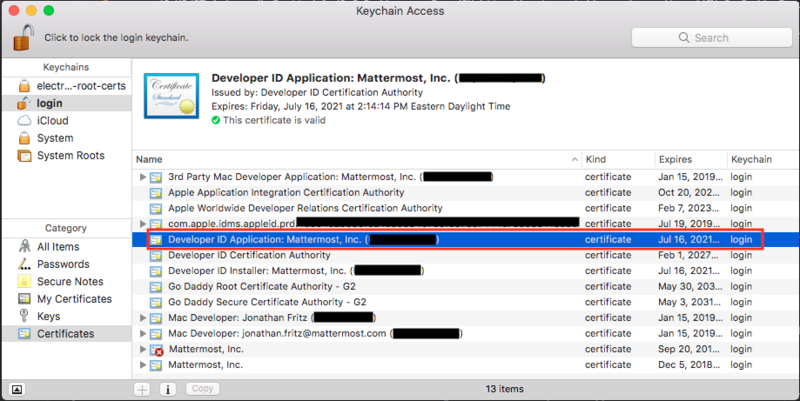 In order to code sign releases on behalf of Mattermost Inc., you’ll need a .pfx (Personal Information Exchange) file that contains Mattermost’s public key (SSL certificate file), and the associated private key file. The file is protected by a password that you’ll need in order to use it. This file has been shared in LastPass. Talk to Joram Wilander, Corey Hulen, or Jonathan Fritz to get access to it. Signing certicates occasionally expire. When renewed, the registrar will provide you with a .spc (Software Publishing Certificate) and a .pem (Public Key) file. These must be combined with a corresponding .key (Private Key) file to create the .pfx (Personal Information Exchange) file that is used to sign builds. If the md5 hash of the modulus of each file matches, they are a valid pair. You will be prompted for a password. This password will lock the .pfx file, and must be provided every time somebody tries to use it. The resulting file can be used in the next step to sign builds. On Windows hosts, Microsoft’s SignTool utility can be used to code sign releases. To install SignTool you’ll need the Microsoft Windows Software Development Kit (SDK). If you have a copy of Visual Studio installed, you might already have it included with the commandlines packaged with Visual Studio. Note that on some Linux systems, attempting to overwite PATH_TO_UNSIGNED_EXE with PATH_TO_WRITE_SIGNED_EXE_TO can result in a crash. It’s best to write the signed exe to a different path, and then use a mv command to overwrite the unsigned exe with the signed exe. Once you have successfully signed the release, you can use the verify flag of the osslsigncode utility to ensure that the signature was applied correctly. Subject: /C=US/ST=California/L=Palo Alto/O=Mattermost, Inc./CN=Mattermost, Inc. NOTE: This verification step will pass even if the certificate that was used to sign the build is expired. Always copy the signed executable to a Windows box, right-click on it, select Properties > Digital Signatures > Details > View Certificates > General and ensure that no validation errors are shown. Releases destined for macOS can only be code signed on a macOS host. It is not possible to sign macOS releases on a Windows or Linux host. In order to code sign releases on behalf of Mattermost Inc., you’ll need to be a member of the Apple Developer program and a part of the Mattermost, Inc. team. You can check your team membership in Xcode by selecting Preferences from the Xcode menu, and opening the Accounts tab in the dialog box that appears. If you aren’t a member of the Mattermost, Inc. team, talk to Joram Wilander, Corey Hulen, or Jonathan Fritz. Once you are a member of the team, click the Download Manual Profiles button at the bottom of the Accounts dialog. Next, highlight Mattermost, Inc. in the team list, and click the Manage Certificates… button. From the drop down box in the top left hand corner of the Certificates, Identifiers & Profiles page that appears, select macOS. Next, under the Certificates heading in the left hand sidebar, select All. The Mattermost, Inc. Developer ID Application certificate should appear in the centre panel of the screen. Click on it to expand it and then click on the Download button that appears. Once downloaded, you can double-click on the certificate file to import it into your local keychain. Code signing is a bit of a black art. Some issues that have been observed in the past are likely to affect you in the future. If you encounter any troubles while code signing macOS releases, please document them here to help the rest of the team. No identity found for signing. 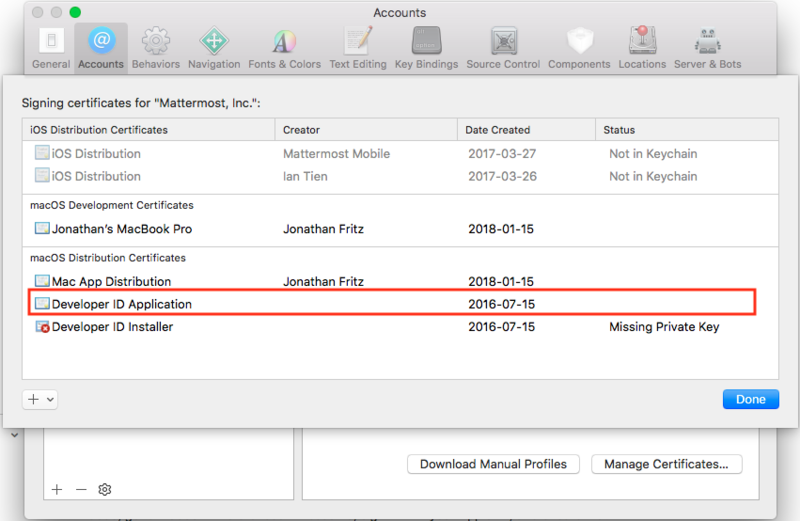 It is likely that you have not successfully imported the Mattermost Developer ID Application certificate and associated private key. See the Prerequisites section above. You have resource files in the wrong place in your release folder. According to Apple’s Developer Docs, all resource files (i.e. anything that isn’t code) must be in the Content/Resources folder within the .app package. In this case, the LICENSE.txt file is located in the top-level Contents directory, causing the code signing operation to fail. This can be fixed by moving any non-code resource files into the Content/Resources directory. If you’re attempting to perform code signing on a remote box via SSH (for instance, if the build is being run on a macOS slave controlled by Jenkins), you will need to unlock the keychain that contains the signing certificate and private key before either can be used. Once you have successfully signed the release, you can use the codesign utility that ships with macOS to verify that the signature was applied correctly.